On 12/14/12, tragedy struck. Authors and artists combined, so that their expressions of emotion could be put to good use. Contributors from around the world came together and we shared our souls for charity. Our effort has combined to create the anthology "Angels Cried." 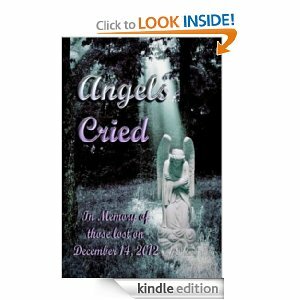 The proceeds of this eBook go to the Sandy Hook School Support Fund, managed by the United Way. All these remarkable authors and artists come together to bare their souls and let the angels sing. Please think twice and realized the tragedy has wounded many. That a new start has to be reborn, a new school and other needs to help the community heal. The United Way has been in existence for a long time and are very efficient with their donations. I have read this book and contribute a poem. As a reader, my heart bleeds, my eyes cried, and my soul soars. There are contributions from authors and artists around the world. This book is insightful thoughtful and inspiration of thoughts. There are stories of an outsider observers of their anguish. To raise the consciousness of humanity, how pain affects us all. There are dedications to all of the angels that departed from us too early. For them and all others who departed too early. This is a treasure and a healing balm to the families affected by this. As well as one of the many steps towards action. You can be anonymous, buy, like, tag and share this book. Go to sleep tonight knowing you invested in the school fund and became secret angels to heal the community wounded by this senseless and brutal offence. 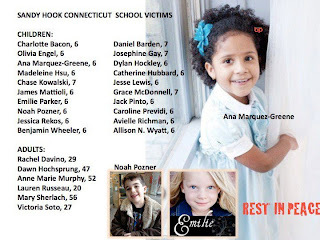 To me the wound was so penetrating to my soul that I could not just let this pass by and forget these angels. Go on the Internet, look at all those precious faces and their bright eyes. Like a candle flame do not let their flames be extinguished. Go to Amazon. com, purchase this gift and/or donate through Paypal button on top. Let the angels sing, be messengers that the violence has to stop. Never to be forgotten. http://www.wisegreyowl.co.uk/php/content.php?Books=View&Book=f26bbbe5-a763-8994-699a-38af0c9781b9 UK link for Angels Cried Anthology. 12/31/12 This blogger as well as the Indies In Action like to thank the evil mastermind and his minions, staff of Indies Unlimited for a beautiful and touching blog, for the last day of the year. It showcases three very worthy causes, so let the angels sing and as a New Year's promise, let's open our minds, hearts and spirits more, and pockets to help one another achieve the impossible, for it is possible when we cooperate together in unity. Grace McDonnell 7,. - a painter and to live on Martha's VineYard. James Mattioli, 6, - "numbers guy"
Caroline Previdi, 6, - Silly Caroline" Previdi had an infectious grin and a giving heart. Benjamin Wheeler, 6 - aged six, loved his brother Nate, soccer, school and the 7 train to Sunnyside, Queens. Allison Wyatt, 6. - She loved art and her drawings were taped to the walls of her home. As one of the contributors, I am pleased with this review. Contributing as I did was not an obligation, but a duty to preserve the memory of those that lost their lives, in hopes that this never happens again. Bravo for a kind word! I cannot think about this without tears rolling down my face. It is a mixture of tears of joy and sadness that I endure, because this event hit very close to me. I hope everyone will purchase a copy, and help the families.